Khara Breeden completed her Doctorate of Nursing Practice at Duquesne University in Pittsburgh, in August 2016. Khara holds a Master's of Science in Patient Safety Leadership from the University of Chicago at Illinois. Her Bachelor's degree is from Regis University in Denver, Colorado. Her nursing career spans over 14 years with experience in critical care, emergency services, women's health, and most currently, forensic nursing and academia. Khara started working at Harris Health as a Forensic Nurse Examiner in 2011 and immersed herself within the field. In 2015, she became the Program Manager of Forensic Nursing Services, and was responsible for the day to day management of the department. After achieving her doctorate, Khara decided to pursue her goal of teaching, and is currently an Assistant Professor at Houston Baptist University. Khara currently serves as the International Association of Forensic Nurses (IAFN) Board Secretary, and has served as the Board liaison of the Strangulation Task Force, Title IX Task Force and the Suspect Exam Task Force. She is also currently the IAFN Texas Chapter's President and serves on the chapter's Education Committee. The University of Texas Health Science Center at Houston School of Nursing is an approved provider of Continuing Nursing Education by the Texas Nurses Association - Approver, an accredited approver by the American Nurses Credentialing Center's Commission on Accreditation. This activity provides 40.75 contact hours of Continuing Nursing Education. 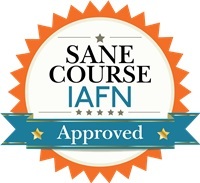 All Registered Nurses with an interest in becoming a SANE. All RNs welcome. The nurse will have knowledge of the role responsibilities of the registered nurse as a forensic nurse examiner, the evidence-based standards guiding practice, components of the forensic exam, evidence collection, and the importance of community collaboration. Sexual Assault Nurse Examiners (SANE) are registered nurses who have completed specialized education and clinical training in order to care for the patient who has experienced sexual assault or abuse (IAFN). This is a 5-day course that will provide the didactic education necessary to begin the clinical training to become a SANE. The event is open to the public. Parking will be available in TMC Garage 2 located at 1151 E. Holcombe Blvd at the intersection of Holcombe Blvd and Bertner Ave. The parking rate is $12.00 per day. Registration is $400 and open to the public. Light breakfast and afternoon snack is included in registration fee. Lunch is on your own.